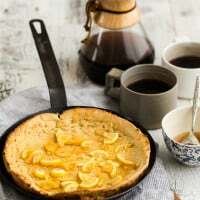 Dutch Baby with Meyer Lemon Maple Syrup | Naturally.Dutch Baby with Meyer Lemon Maple Syrup | Naturally. Take one Meyer lemon and cut in half lengthwise. Cut each of those halves in half and thinly slice the lemon into triangles, removing any seeds. Place in a sauce pan or skillet. Juice the other Meyer lemon and add to the pan along with the maple syrup. Heat over low heat while making the dutch baby. Combine eggs, milk, maple syrup, flour, and salt in a blender. Pulse until combined. On the stop top, melt butter in a 10″ oven-proof skillet. Swirl around to cover the pan once melted. Remove from heat and pour in batter. Bake in oven until golden brown and puffed, 20-25 minutes. Serve with the Meyer lemon slices (see note). If someone doesn’t want the lemon slices but would like the lemon flavor, strain out the lemon pieces and place in bowl, serving the maple syrup and lemon slices separately.